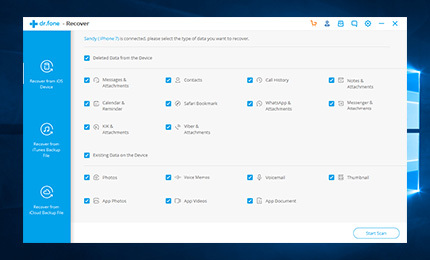 This program is able to get back photos, contacts, messages and phone calls you lost or deleted from your iOS devices such as iPhone / iPad/ iPod touch on Windows easily. From some common circumstances, the data may be deleted, damaged or even stolen, or else it can be lost after factory restore or iOS update. Using this software, the lost data can be recovered easily and with 100% safe guarantee. This program allows you to check and preview all deleted or lost data on your iOS devices and scan the detail for free. The iOS data recovery software is capable of helping you to view and even download the iCloud backup content for free. While Apple prevents users from reading the information of iTunes backup file, the iOS data recovery program can do it and it's also for free. The iOS data recovery is more than a recovery tool. After you scan all the data, you can preview and print the file if you need it with only one click. This iOS data recovery software enables you to recover data up to 18 file types including contacts, messages, photos, notes, call history, reminders, WhatsApp messages, and so on. This application is able to verify data before recovery and recover the data as selected. Old data will not be overwritten by the new one. The whole procedure takes only 3 steps: connect, preview and recover. It is 100% safe that you are the only one who can access your account. And it offers 30 days of free trial before you make a purchase.